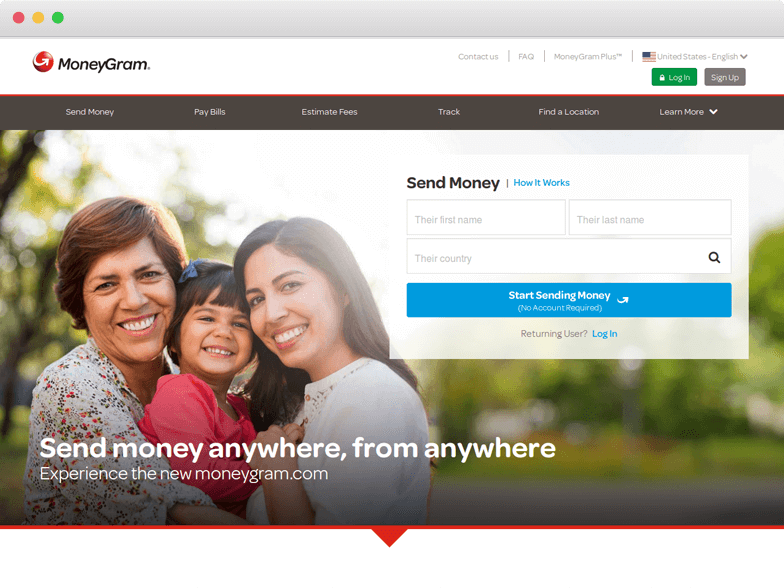 All the useful information that you need to know before sending money with MoneyGram! The company has a minimum transfer limit of USD $1 and one can transfer the maximum amount up to USD $6,000. This is a daily maximum transfer limit, so one cannot send more than $6,000 in a day. Besides this, it offers MoneyGram Plus services to its users, where they will get more benefits including fast transfers, email notifications as well as personalised offers which will reduce the transfer fee. The customer services of the company are available 24*7, so, users can anytime contact the company regarding transfers and payment related queries. One can also request for MoneyGram refund as it provides 100% refund in 7-10 business days. MoneyGram is highly secured, so one can use its services worry-free. On an overall basis, we rate it 8 out of 10 because it has a lower maximum transfer limit, which is a major drawback. Pricing : How much does MoneyGram cost? The company charges $11.00 if you are transferring funds from a bank account and $49.99 if the amount is transferred through debit or credit card. Besides this, it takes approximately 2% of the total amount transferred. In the cash transfers, it has additional charges because it reaches the recipient in minutes after transfer. The company offers mid-market exchange rates to its customers. It applies the standard practice of taking a margin on the exchange rate where mid-market exchange rates may exceed up to 5% occasionally. So, MoneyGram rates are basically lower than many of its competitors. The company may ask for various fees depending on the country and currency of the recipient as well as sender. You can check all the fees here at MoneyGram Fees calculator. So, for its pricing policy, we rate it 7 out of 10 because there are many companies which offer lower fees and better exchange rates with no margins of profit. Transparency: Does MoneyGram have any hidden fees? The company is offering highly transparent services and does not charge any hidden fees. The company locks exchange rate once you start the transaction and the same amount will be received by the recipient. For tracking the transaction process with MoneyGram, you need to enter the reference number or authorization number as well as your last name after which you will get where your amount has reached. You can track your MoneyGram transfer here. So, for MoneyGram’s transparency, experts of Exchange Rate IQ have given 10 out of 10. Transfer Speed: How long does it take to send money through MoneyGram? MoneyGram Money Transfer speed depends on the destination country, receiving bank and its working hours. Still, if you are making the transfer through a bank account, then it will approximately 3-5 working days. While if you have transferred funds through a MoneyGram agent location, it will be received by the recipient in minutes (available in working hours only). It offers fast transactions to MoneyGram Plus holders, but that will also take up to 1 working day. So, for the transferring speed, we rate it 7 out of 10. Security : Is MoneyGram Safe? So, your first question before using the services of MoneyGram would be, is it safe? Then you will be happy to know that the company is subject to a wide range of laws and regulations across the world. The company is licensed in all the 50 states, the District of Columbia, Puerto Rico, the US Virgin Islands and Guam. In the UK, it is licensed as an Authorized Payment Institution under the European Union Payment Services Directive. Many other jurisdictions also provided the license to MoneyGram to work in various countries. So, the company is highly secured and has become the second largest fund transfer provider in the world with its best services. Hence we rate it 10 out of 10 under the security head. Easy cash pickups across the globe. Only debit card, credit card and cash transfer options available for the users outside US and Canada. You can also fill MoneyGram online form here to get a call back from the company. The company provides cash benefits if you share a unique link provided by the company to your friends and they make the first payment with a minimum amount of $50. The company provides its promo codes to users by notifications, email or SMS. They can use these promo codes to get discount on the transfer fee. The company has also provided FAQs for the general customer questions, besides this, it has been providing worldwide services for businesses or personal transfers. So, on overall user experience, we rate it 7 out of 10. So, for starting the services of MoneyGram sign up here. Coverage: How many Countries & Currencies does MoneyGram support? The company has more than 25,000 agent locations in Africa alone. Besides this, you can also find MoneyGram locations near you here. For using the online services of MoneyGram login here. We rate it 8 out of 10 for its coverage, because there are still many countries which are needed to be covered by the company. Run for the hills!!! I don't know how this business is still operating... No way of completing a transaction online. Bait and switch to charge extra fees at store locations. Time for someone to plug the gap in this market and solve this basic issue for consumers. Criminal organization !!! Dear users if you want that your money come safe to receiver hands use other service. I sent money from Bosnia to my friend in Germany and when he came to pick up money gues what, no money. Someone else is intruduce like my friend and pick up money. That means this is a criminal organization and they work with other thiefs. So if you want to not be cheated use other service. This is CRIMINAL ORGANIZATION !!! Money Gram is horrible. I recommend using any other service, but them. A refund of your own money takes up to 10 days. All, I asked was to add an additional receiver to a transfer that I sent. Never Again!!! Terrible I send money to my wife and kids out of the United States and I'm a citizen. They always questioned whether you known the person ,well on my last attempt to send money I was decline then called money gram and spoke to a person with terrible English and I ask him if he was mexican Because I do speak spanish , after that I've been block from sending money MONEYGRAM YOU'RE DISCRIMINATING DO TO POOR COMUNICATIONS ON YOUR SIDE AND POOR LUCK OF TRAINING. After using them occasionally for a year or so, they suddenly cancelled my transfer and told me I could no longer use their service again. They basically accused me of some type of wrong doing without any investigation. What an insult. Had to scrabble to send the money some other way. Luckily I got a refund fairly quickly. They originally told me it could take 10 days to get it. Too bad one cannot give 0 stars. Too bad one cannot give 0 stars. Completely incompetent people and system. First, the account got confirmed. Then, the money transfer was confirmed. The money was taken from the credit card. Then, out of nowhere, the transfer was canceled. With no explanation or anything else. Then, the payment will be transferred back to me in 3-10 days. Which is a huge variation in the amount of time it takes to transfer back the money they pretty much stole at this point. When asked for the explanation, they come up with some security issues and that I will never be able to use their s****y service again. Well, thank god for that, cause the only reason I'd use it again is if I got dementia. Not to offend any people with dementia but you gotta be sick to use that kind of certain again. Best of luck. They closed my online account without any reason. it was very bad experience with money gram. now I will find out to another way to send money overseas. I will not recommend to anyone. Do they get off on denying transfers? They deny but still take the money from the account? Do they make money off that? I mean, what the eff?! Leider schlechte Erfahrung. Wurde ausgefragt, wie ein polizeiliches Verhör. Dann wurde Transaktion genehmigt und mein Geld eingezogen. Plötzlich Fehlermeldung, Zahlung wird nicht akzeptiert. Daraufhin wird behauptet der Empfänger hätte in der Vergangenheit für Probleme gesorgt, hatte aber nie Moneygram benutzt. Geld ist weg, wird wohl zurückkommen, aber wann und wie keine Infos, mein Account wurde auch gelöscht. Money gram is a big time fraud. I sent $500 to a friend in China, I was told it has been sent at the local money gram office I went. Later in the day I received a call from my friend that no money was sent to him then I went back to the branch I deposited the the money and I was told to fill a form which I did. Now I’m begging for refund and I was simply told the money is on hold in Chinese Moneygram. This guys needs to be arrested, they’re nothing but criminals. My account was closed without reason and support couldn't unlock it. From now I will give my businesses to Western Union. I wish I had read the reviews before sending money via MoneyGram. They now have my £200 which I have to wait 2-10 days to get refunded. The money was taken from my account and when I queried where it was they told me my bank had blocked the payment and I needed to contact my bank. I spoke to my bank and was told the money was paid out, they provided me with the sort code and account number the money was paid into. I then called MoneyGram again and was told there was an error in the transaction and I will have to wait 2-3 working days to be refunded. I then asked to speak to the manager, ‘Evie’ and was then told with no apologies that I will have to wait 2-10 working days. Avoid if you do not want to lose your money and add stress to your day. Poor everything! I will now be making a complaint to the financial ombudsman. Transparenz für den Endkunden schaffen. Was genau soll MoneyGram tun, Geld für eine hohe Gebühr an eine andere Person transferieren. Auch ist das Risiko gering, da man meist bar einzahlt, oder durch die Kreditkarte direkt belastet wird. Natürlich wäre es schön, wenn dabei geltende Gesetze nicht verletzt werden. Aber auf Verdacht gesperrt werden, weil sich der Geld-Versender nicht wohl fühlt, ist Diskriminierung. Auch aus welchem Verdacht heraus? Erste/ zweite Geldsendung OK, dritte darf nicht raus?? Go to the MoneyGram website. You need to log in or sign up for transferring funds and knowing the fees as well as exchange rates. Enter all the details asked by the company for registering. Enter the details of the bank account. Enter the amount by selecting the currency of your and beneficiary. Re-check all the details and send the funds.